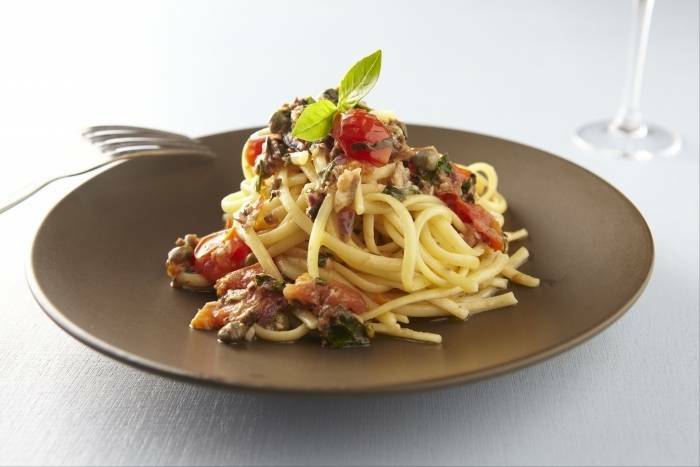 Fresh linguine served with a spicy tomato, black olive, caper and basil sauce. Make the fresh pasta as per the recipe. Roll the pasta through the pasta machine until number 8. Use the cutting tool on the pasta machine to cut the linguini. Dust with '00' flour to prevent the pasta sticking together. Drain and finely chop the anchovies. Roughly chop the black olives. Drain and rinse the capers. Cut the chili in half, de-seed and then finely dice. Peel and finely chop the red onion. Peel and finely chop the garlic. Shred the basil leaves. Wash and pick the rocket leaves. Heat the olive oil in a large saucepan and then add the garlic, onion, chili and anchovies. Fry for 1-2 minutes and then add the capers, olives and tomatoes. Stir over a high heat until the onions are soft. Check the seasoning (the anchovies, capers and olives are all quite salty so you probably won't need to add any extra). Heat a large pan of water until boiling vigorously. Add a large pinch of salt. Cook the fresh linguini for 2 minutes until 'al dente'. Drain into a colander and then return to the pan. Season with salt and a drizzle of olive oil and then mix in the tomato sauce. Finish with some fresh parmesan shavings and a few rocket leaves.